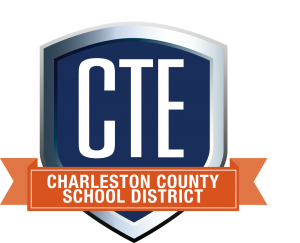 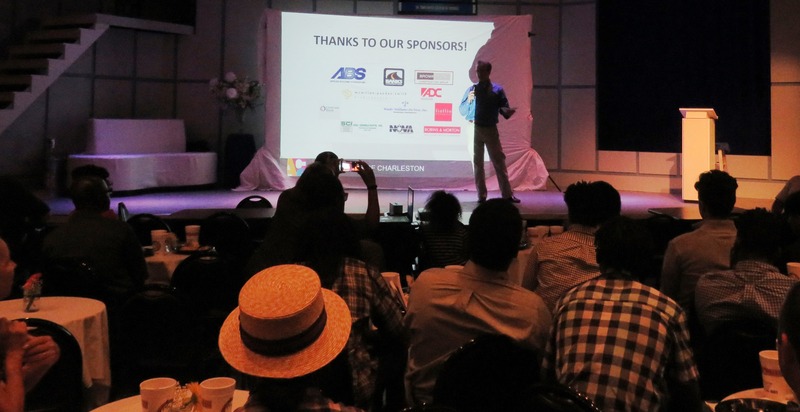 Charleston, SC – May 17, 2017 – A group of local architects, contractors, and engineering professionals are doing their part to ensure the next generation is ready for the critical infrastructure and development related jobs in Charleston, and throughout the nation. 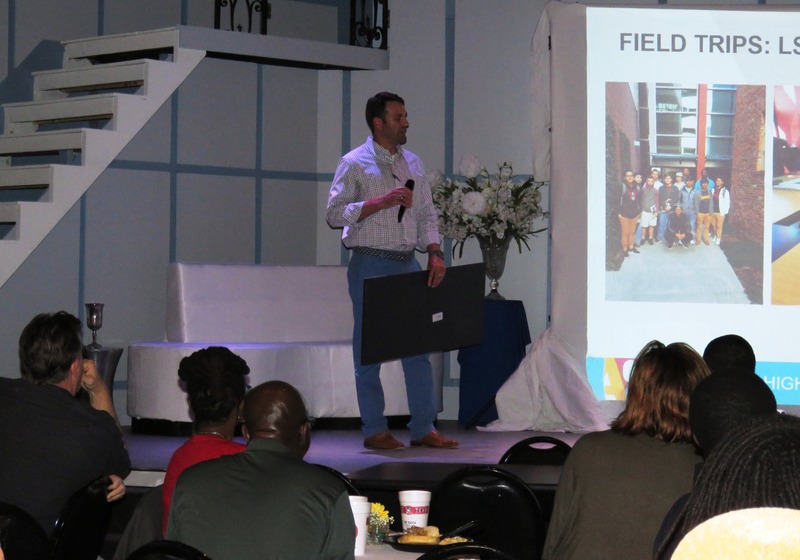 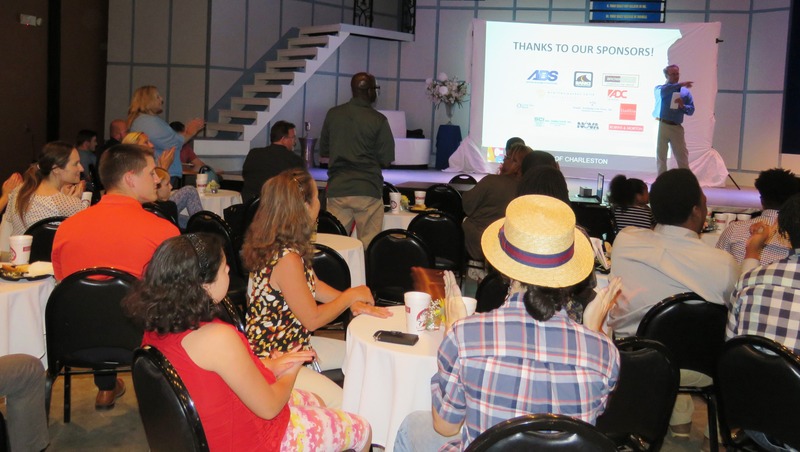 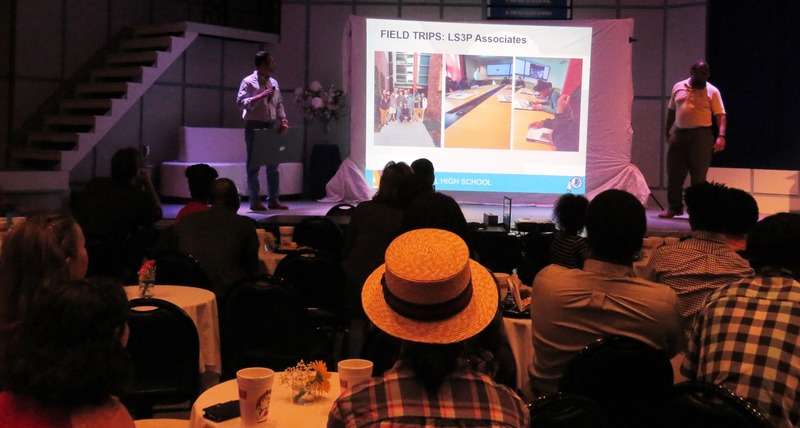 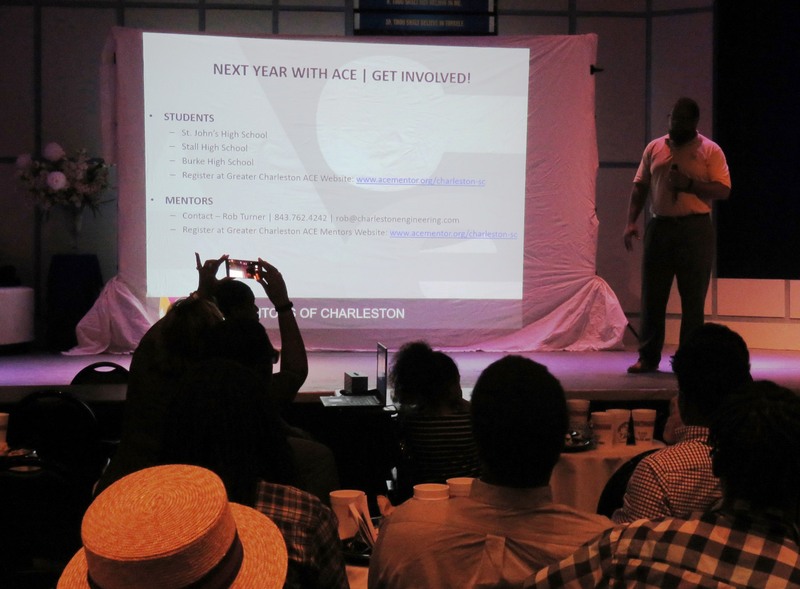 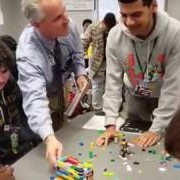 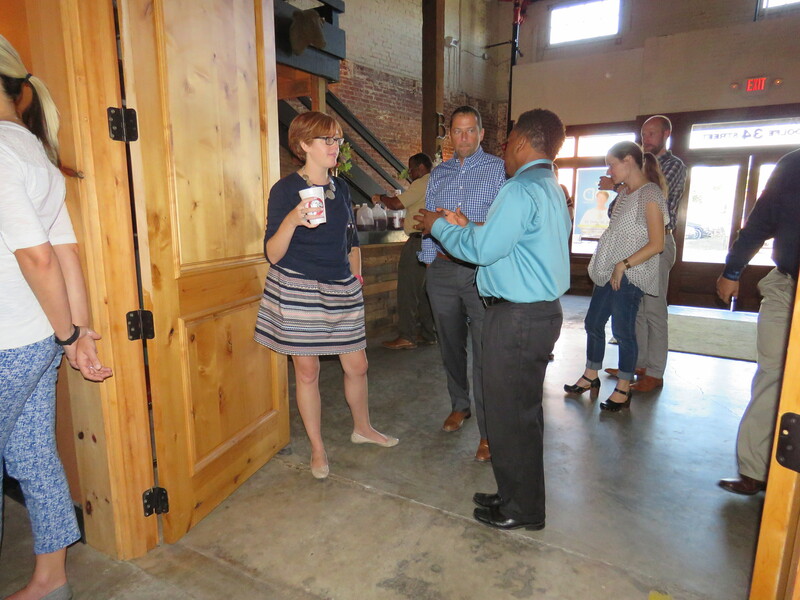 ACE Mentors of Charleston connects professionals with local classrooms for project-based learning and relationship building. 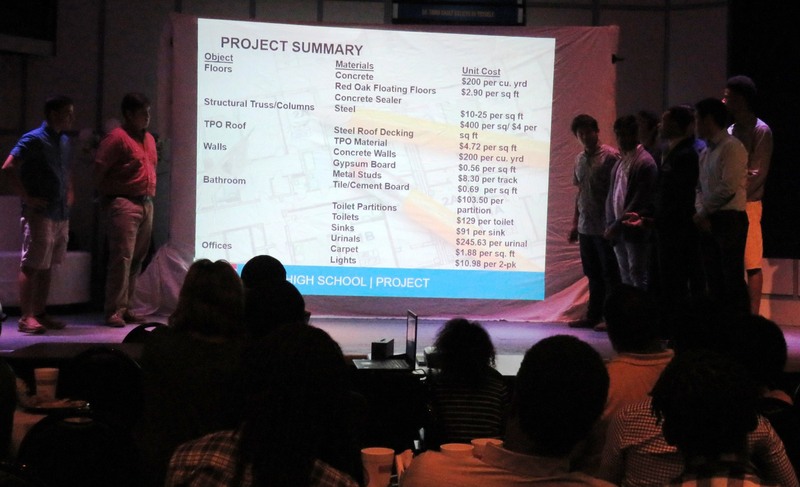 Students work in teams on various aspects of large scale, multifaceted construction projects. The students choose the projects and all the elements to bring the design to a workable set of plans, and even a scale model in some cases. 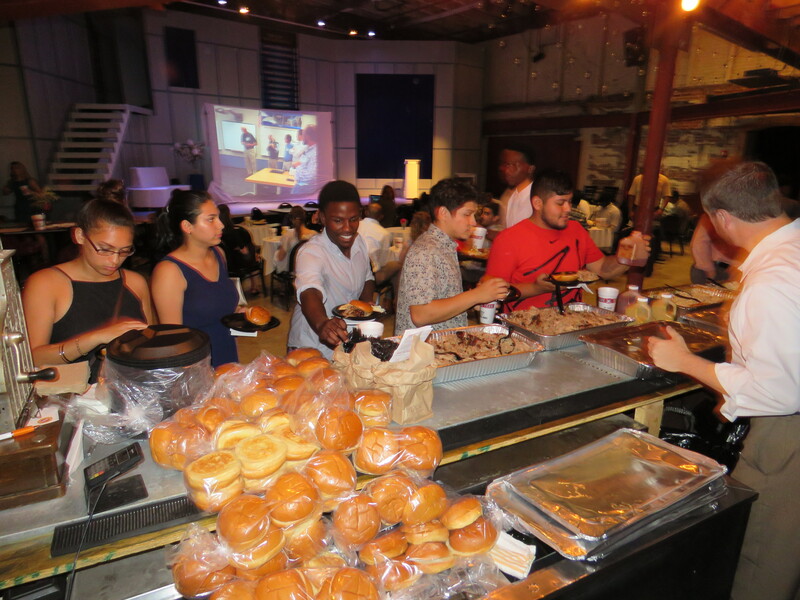 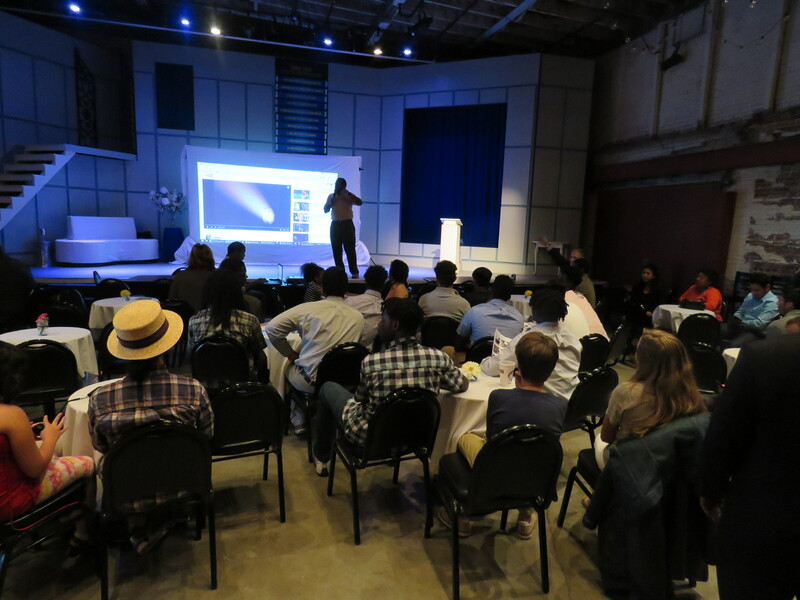 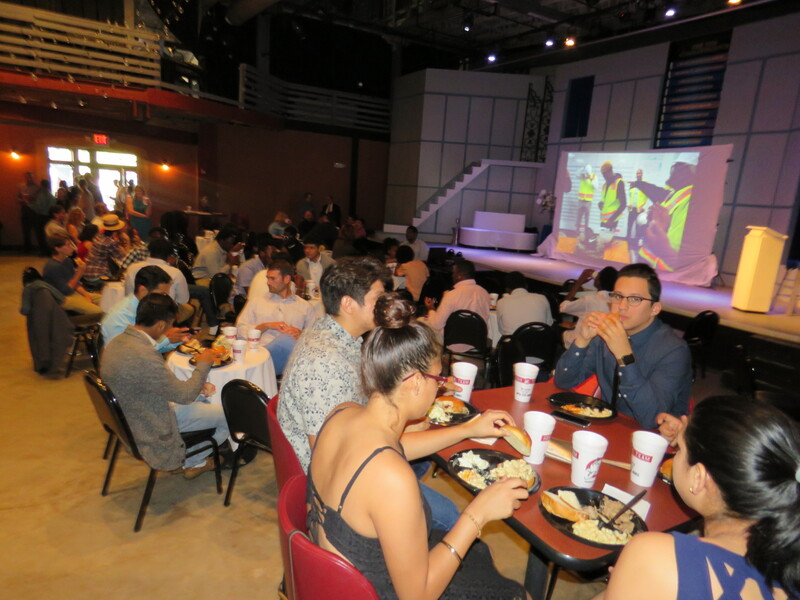 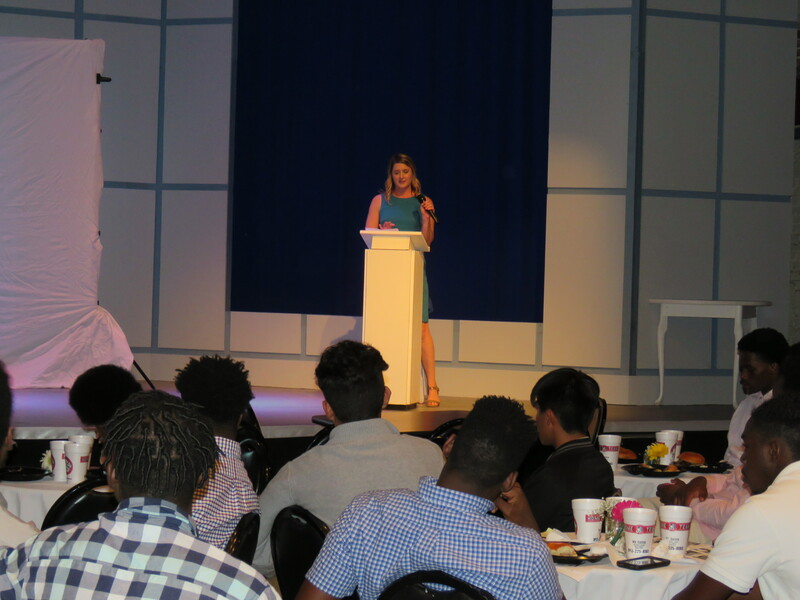 Each year, to celebrate the students’ success and the investment of time by the many volunteers, a special banquet is held to allow each team to share a presentation on their chosen project. 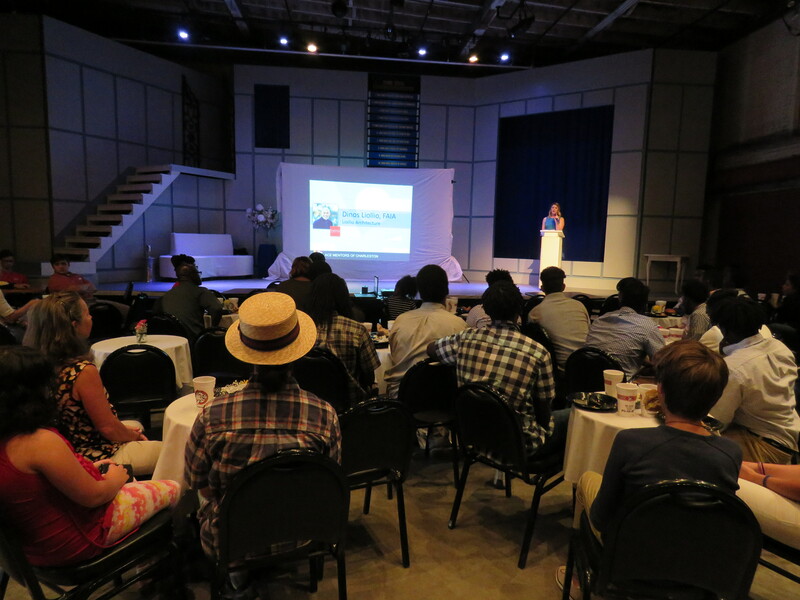 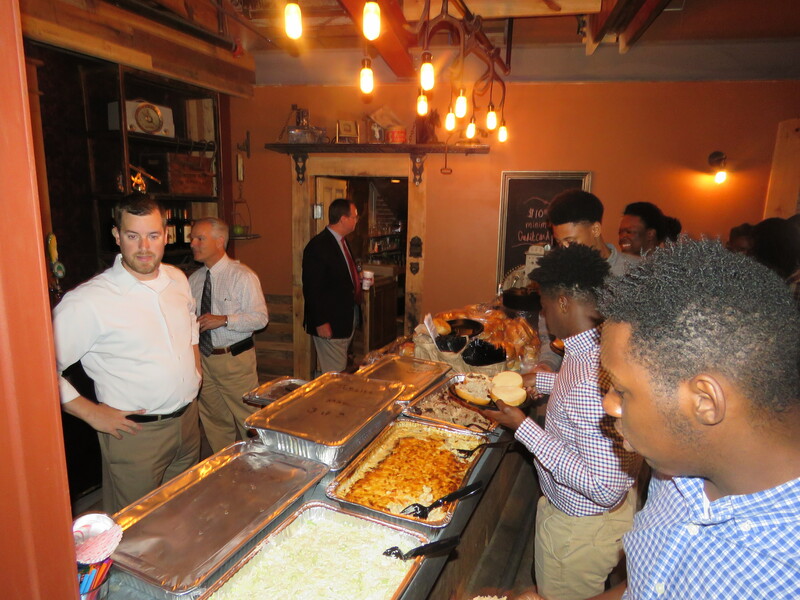 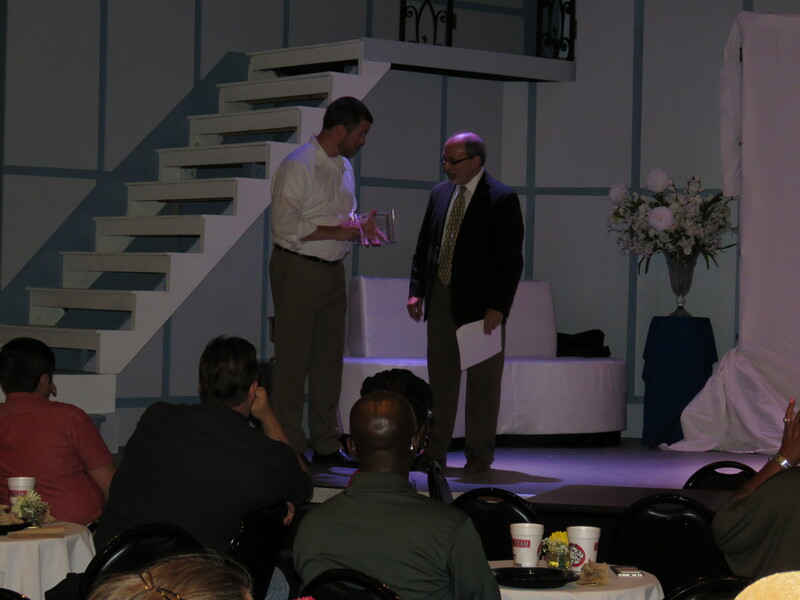 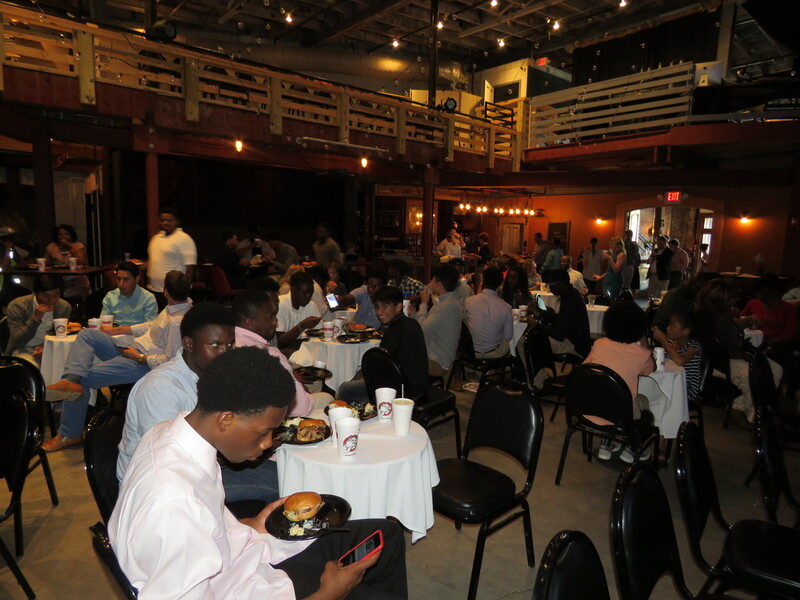 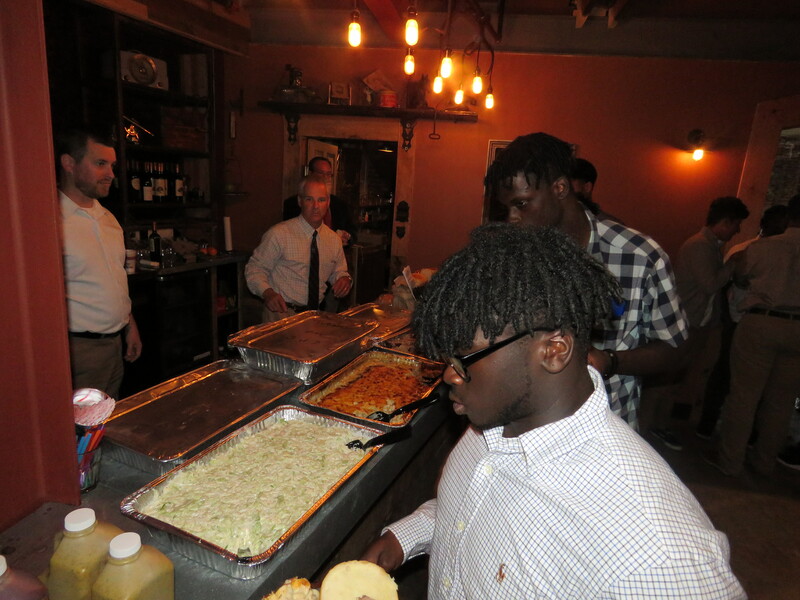 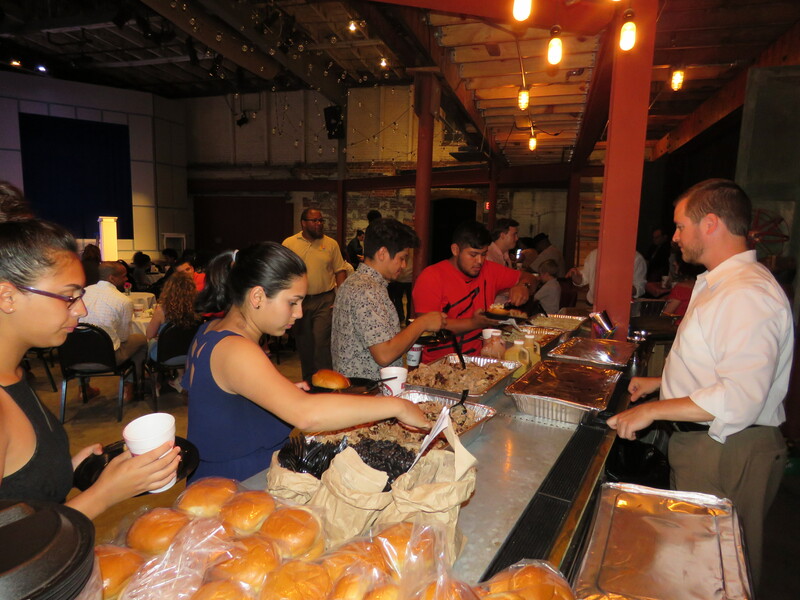 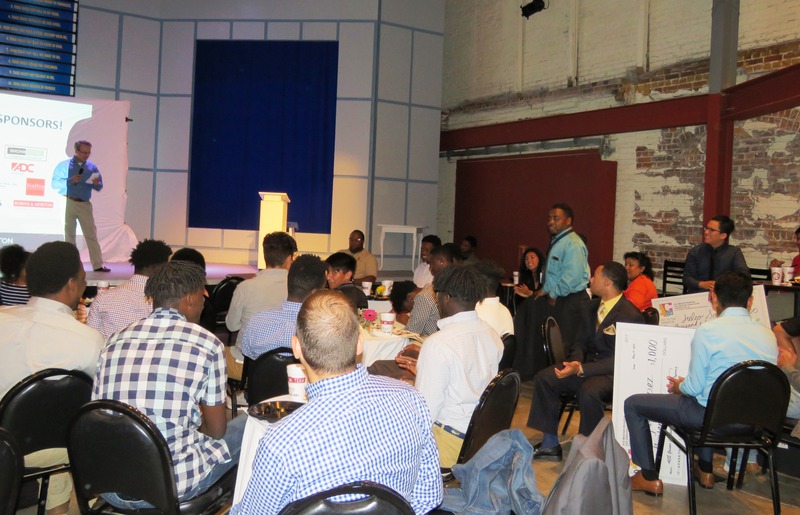 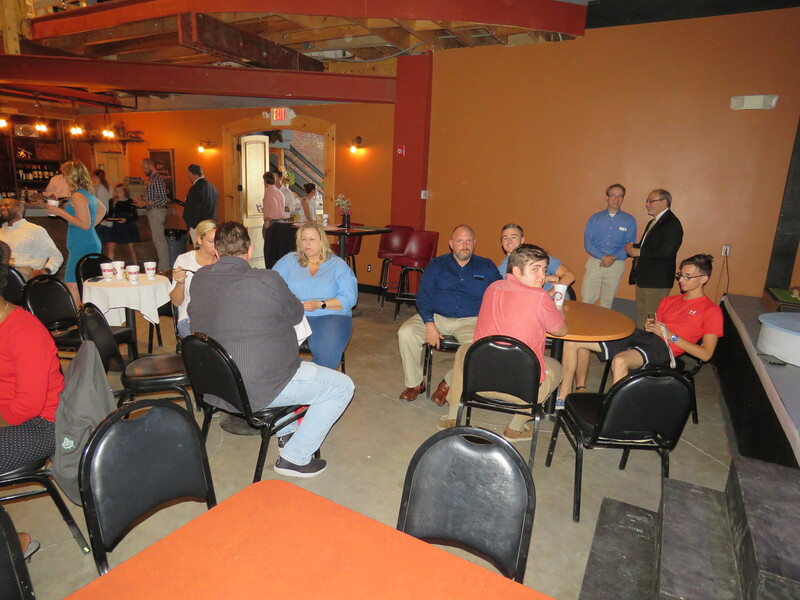 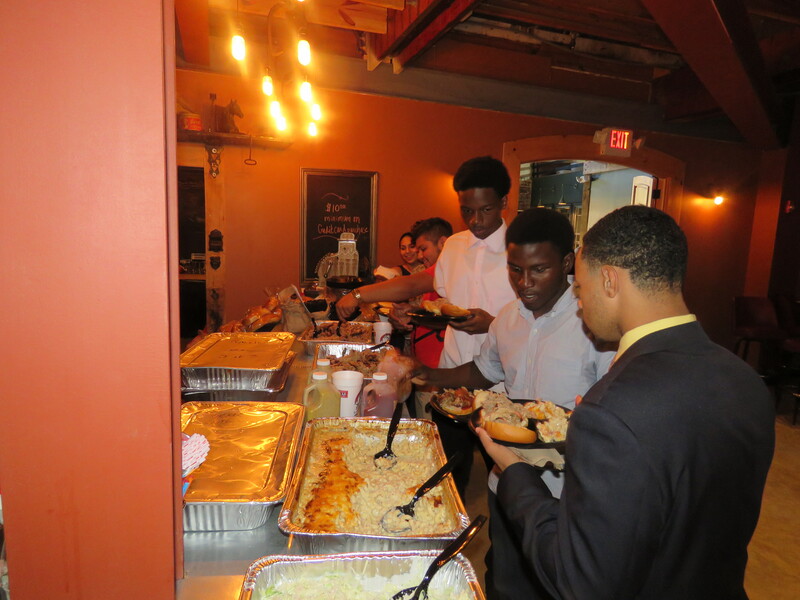 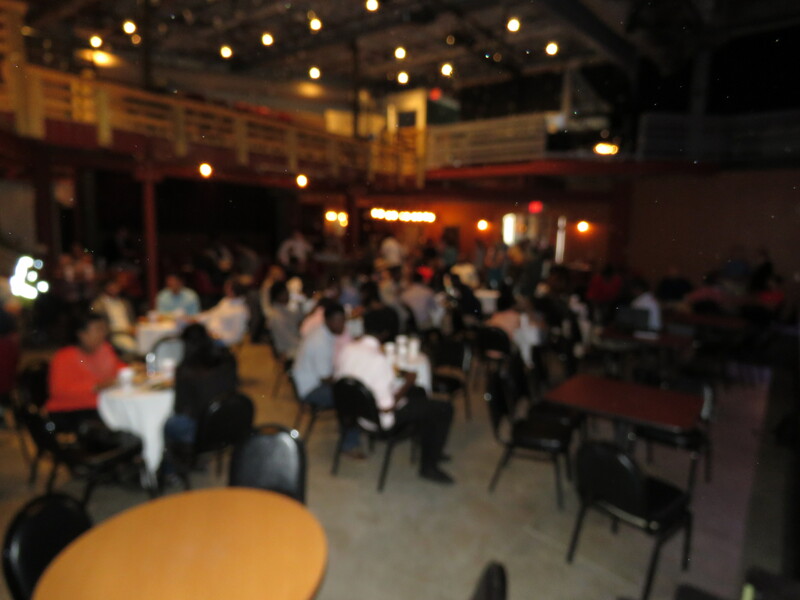 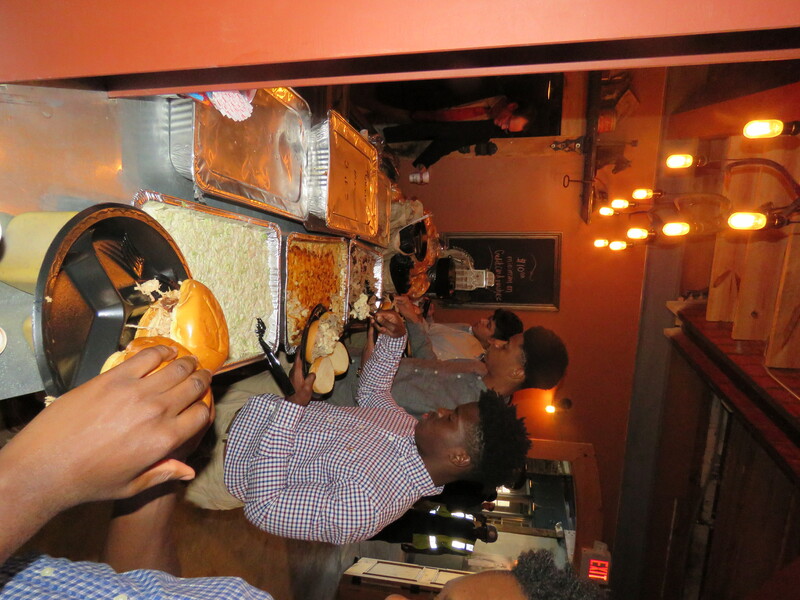 The 2017 ACE Banquet was held at the Wolf Street Playhouse again, and Home Team BBQ was served, complete with cole slaw, mac & cheese, and iced tea. 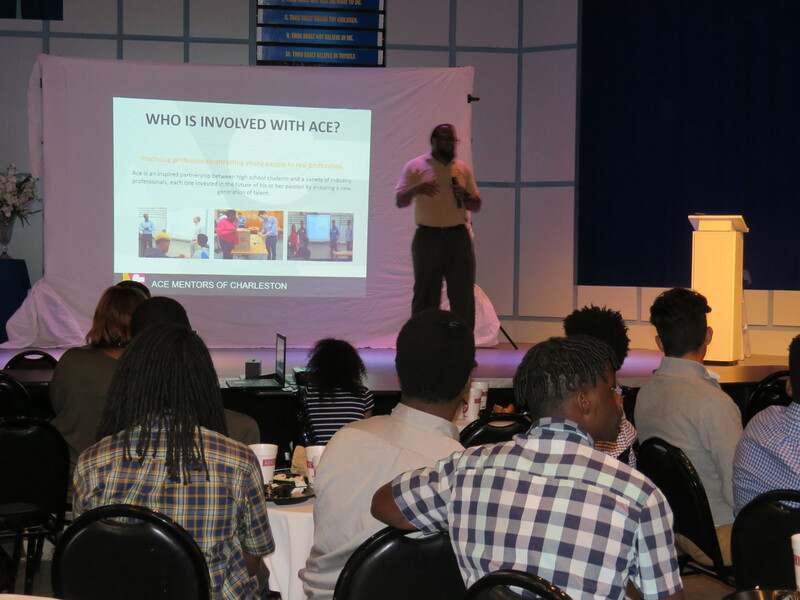 This year, 3 CCSD schools participated in the ACE Mentoring program: Burke HS, St. Johns HS, and R. B. 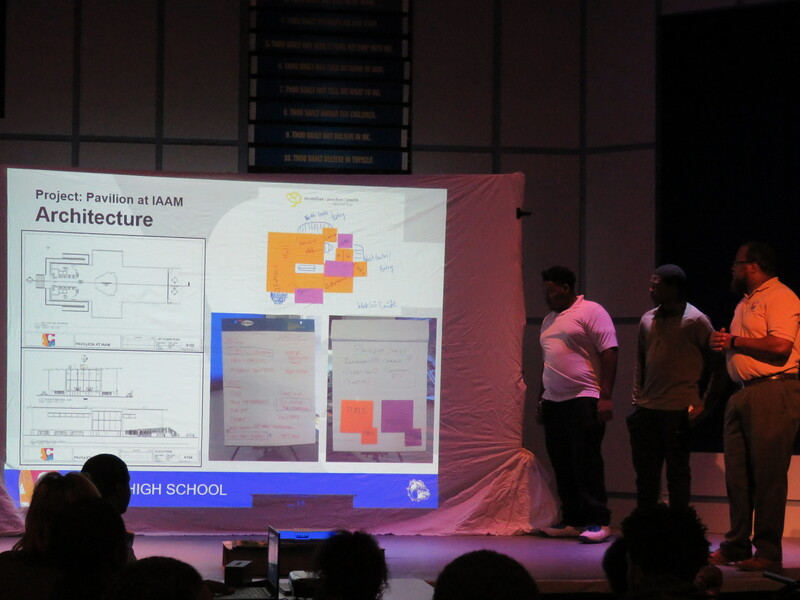 Stall HS. 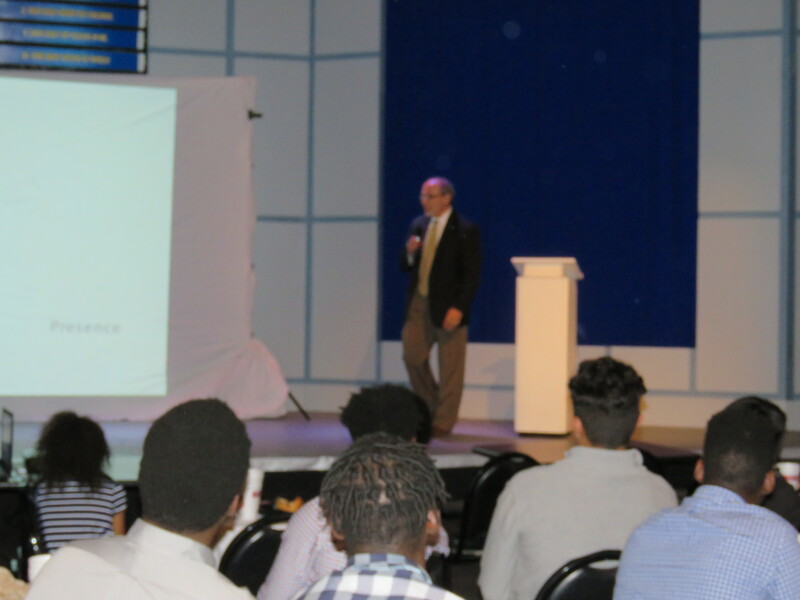 Dinos Liollio, a 40 year veteran of the industry, provided the key note speech, and his chosen topic was timely for the students waiting to deliver their own presentations. 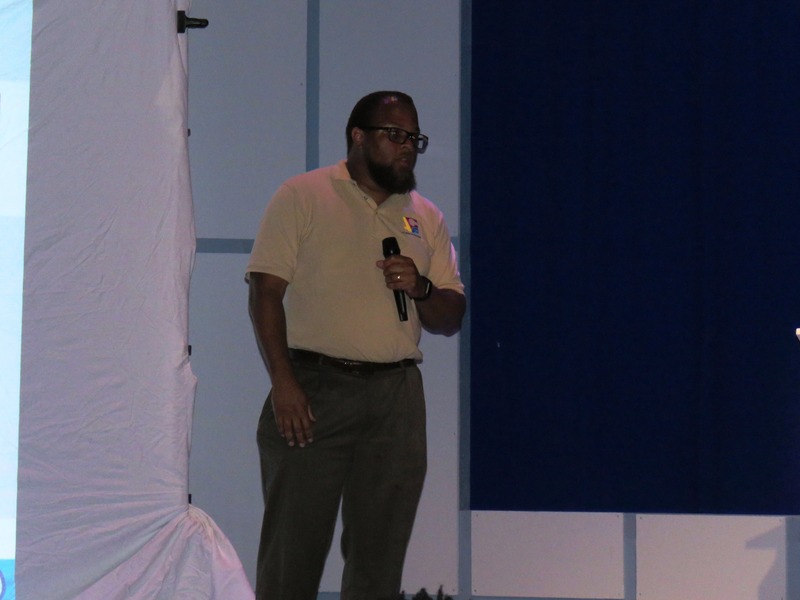 Mr. Liollo spoke on the impact of non-verbal communication. 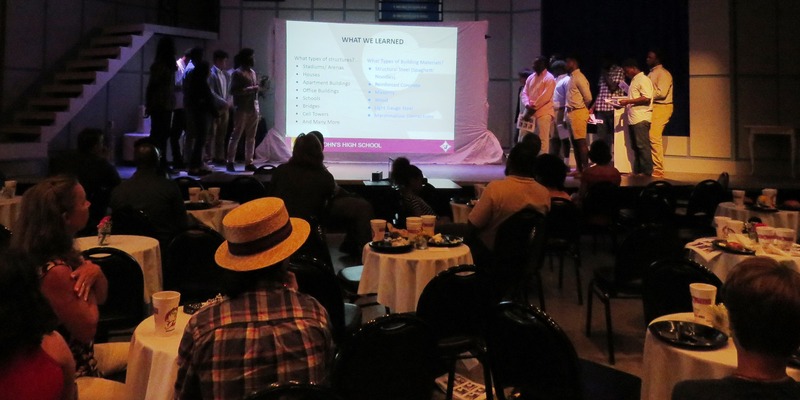 He used many pictures and a movie clip to illustrate his points, and ended the presentation with a video of the dramatic pre-game ritual performed by the All Blacks Rugby Team from New Zealand. 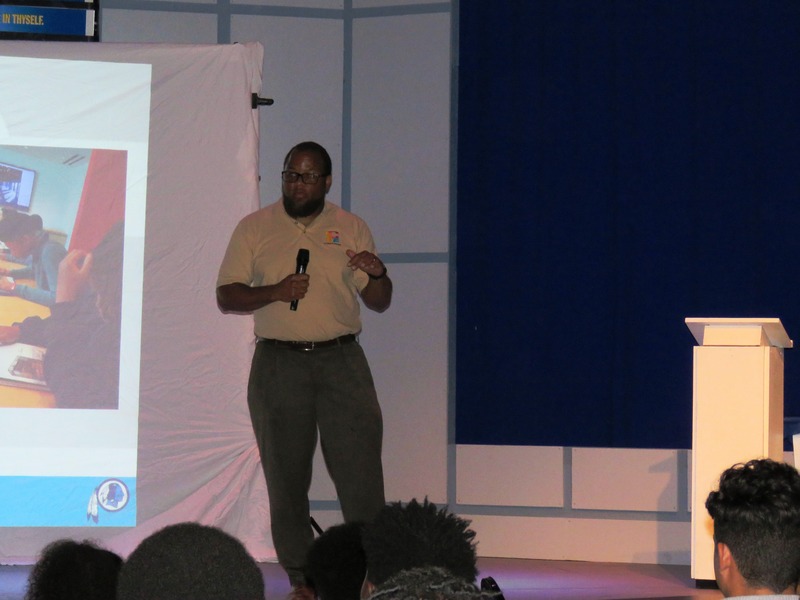 He encouraged the students to be aware of what was being communicated by the position of their arms and legs, their facial expressions, and their eye contact during conversations. 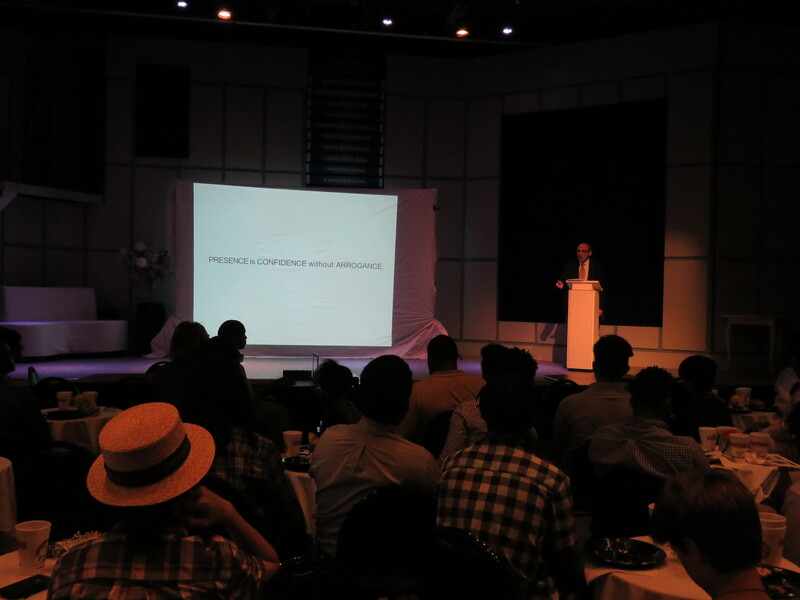 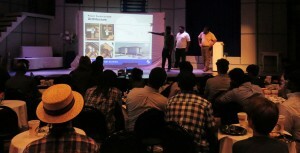 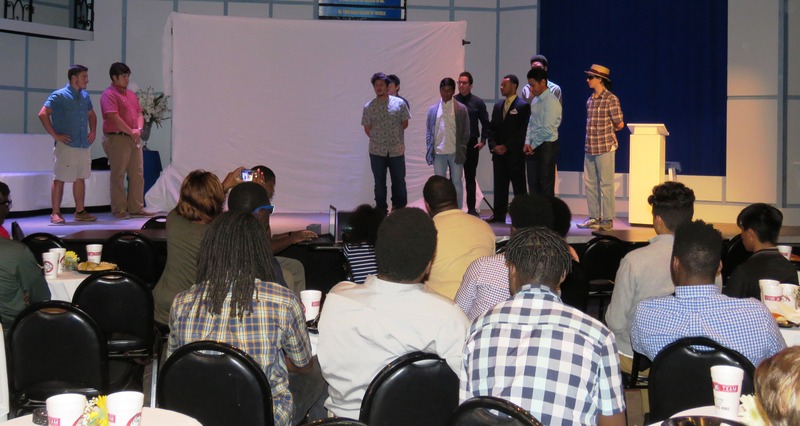 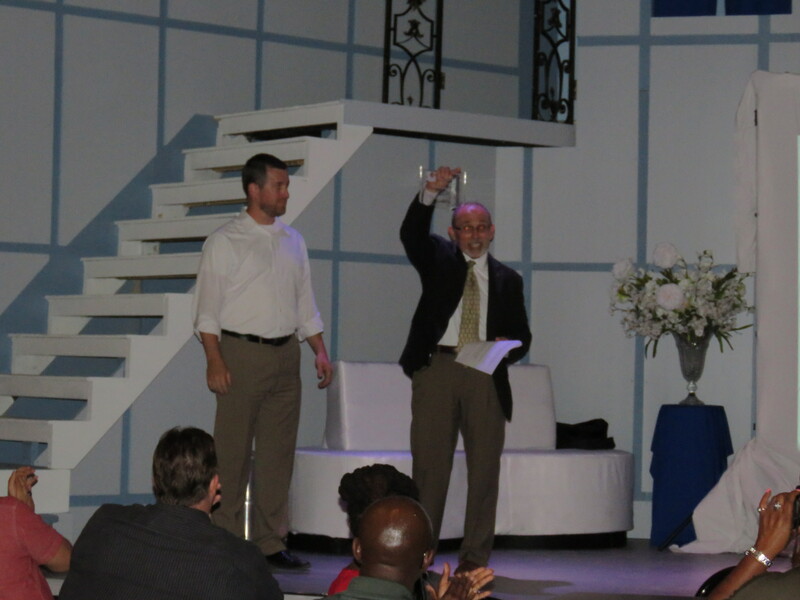 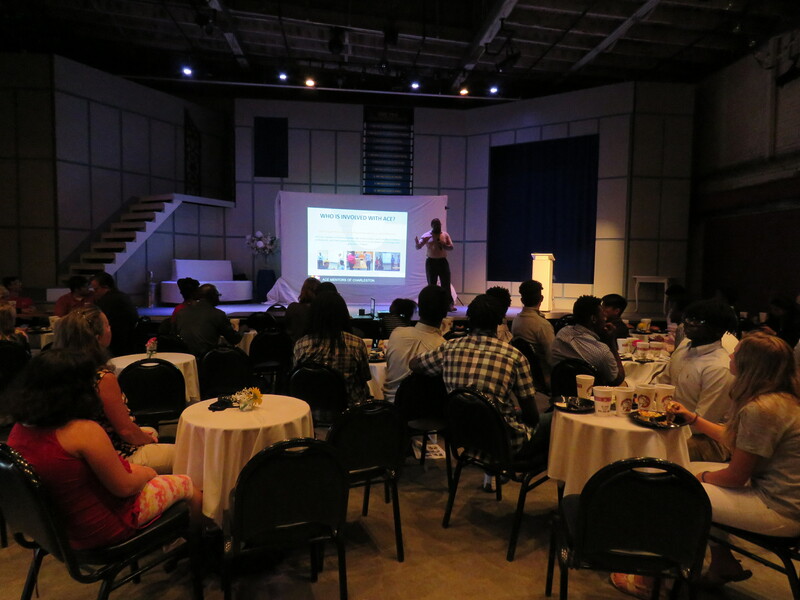 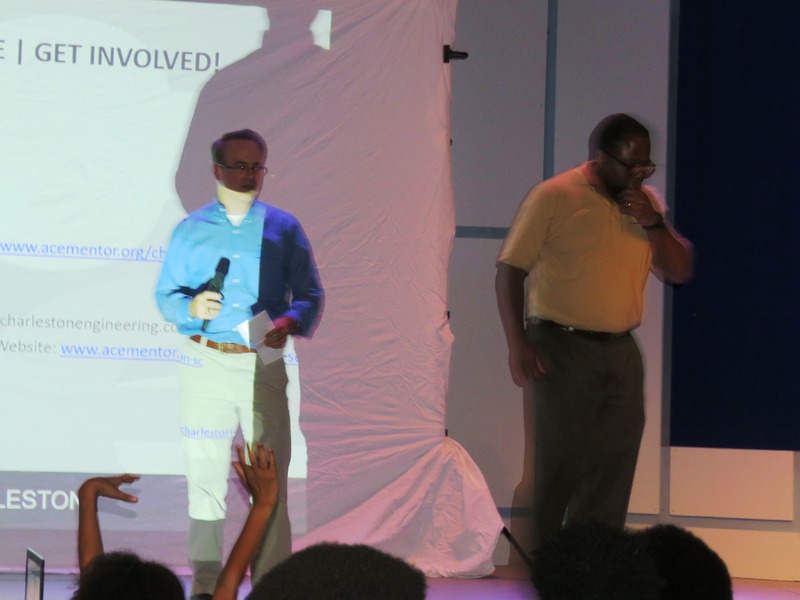 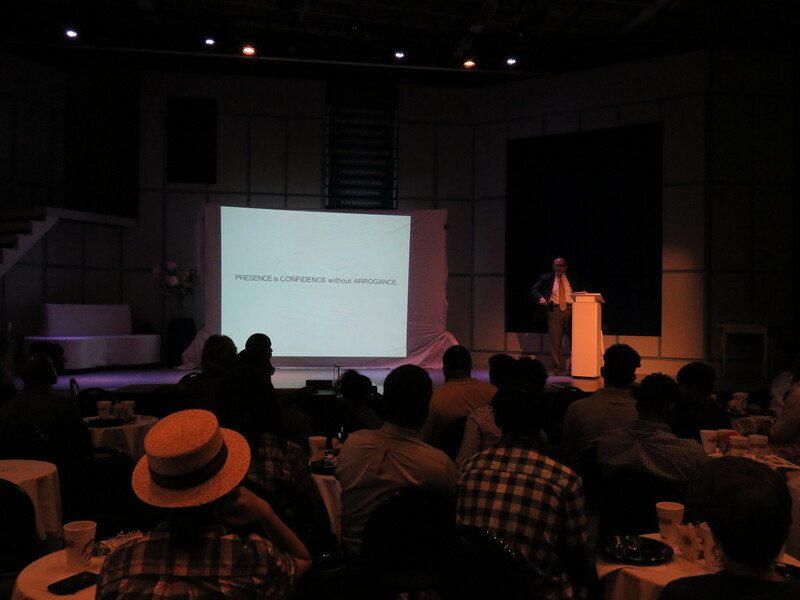 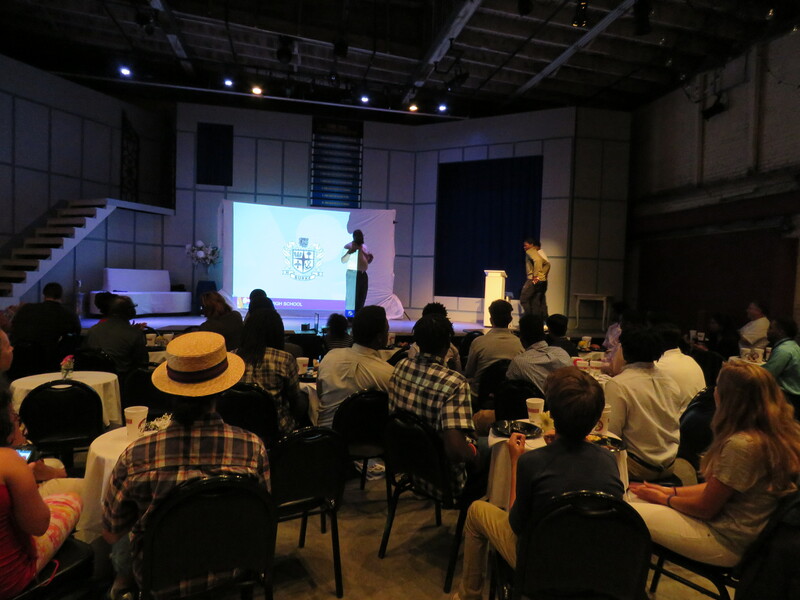 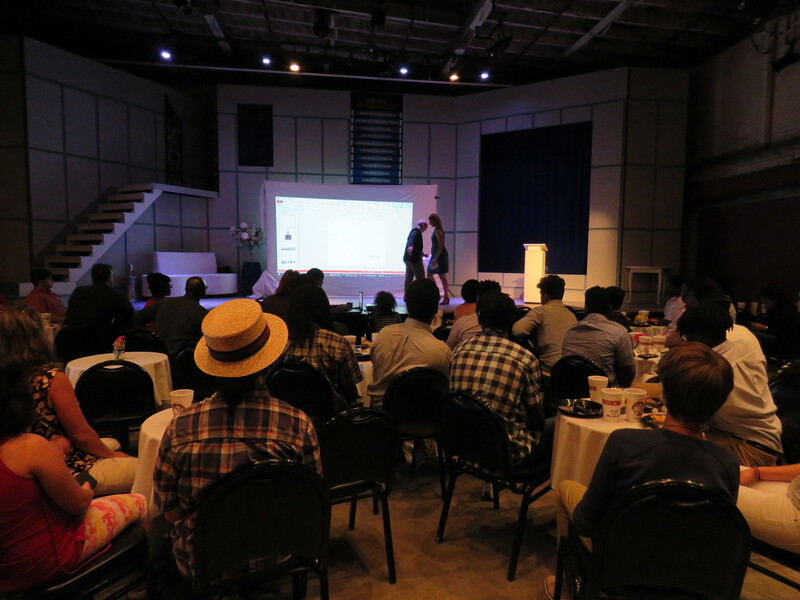 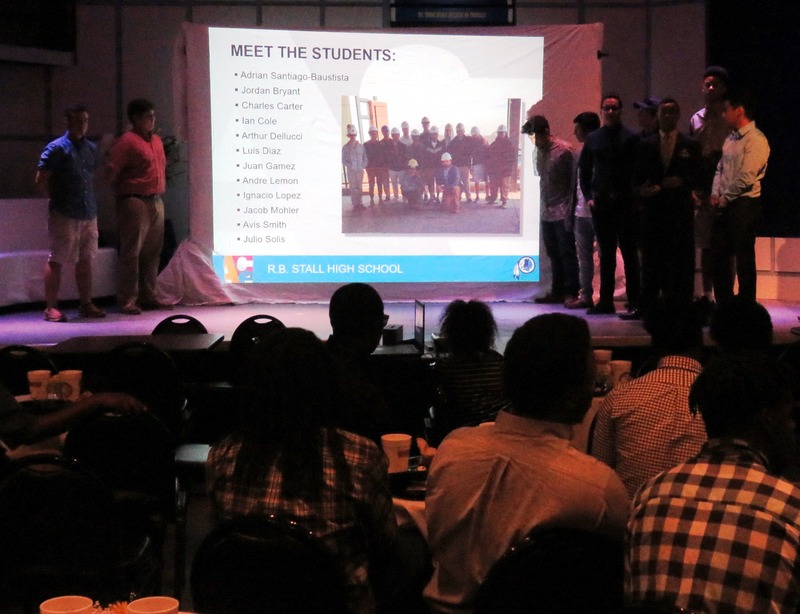 After the keynote presentation concluded, each school was invited to the stage to present their class project. 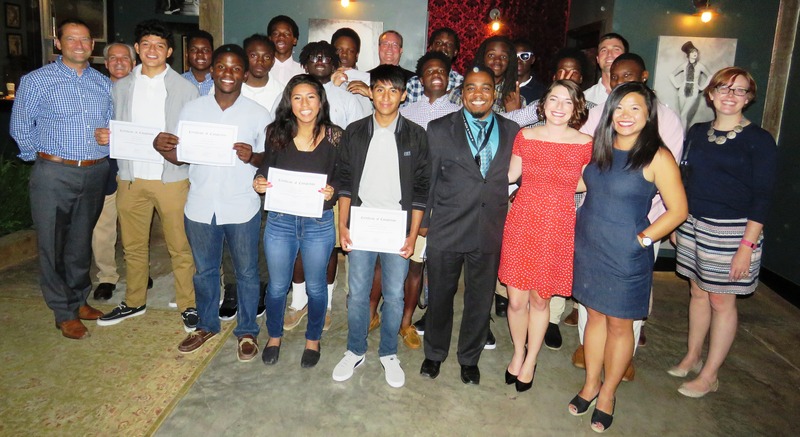 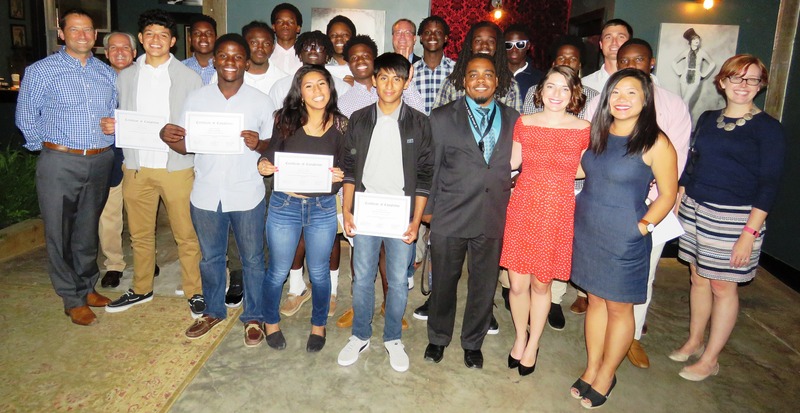 Last night at the presentation banquet for ACE, a student mentoring program with Architects, Contractors and Engineers, outstanding young people from Burke High School, St. Johns High School and R. B. 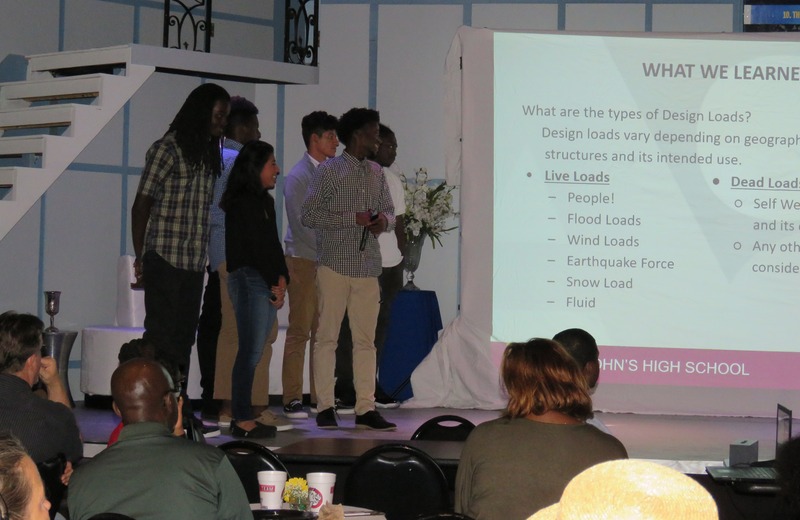 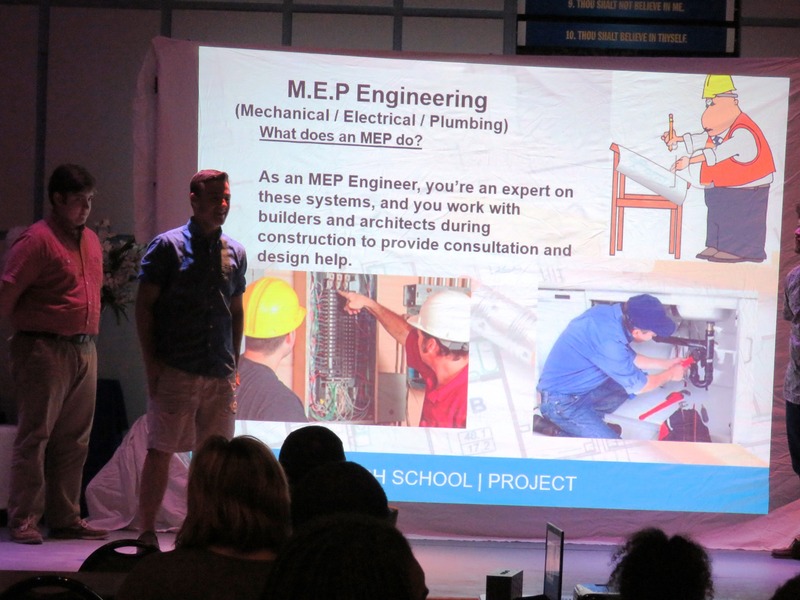 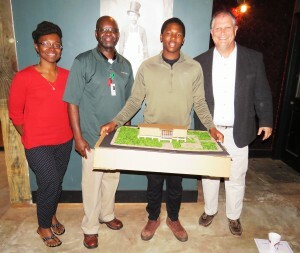 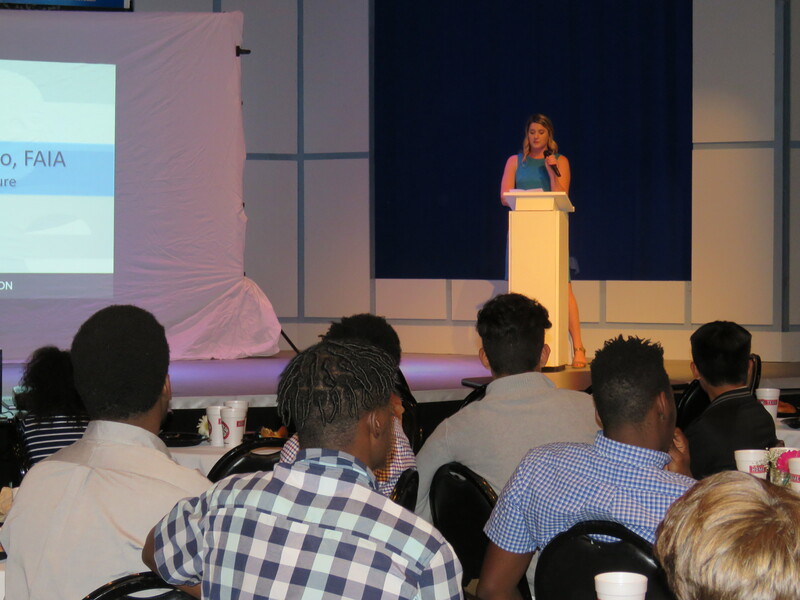 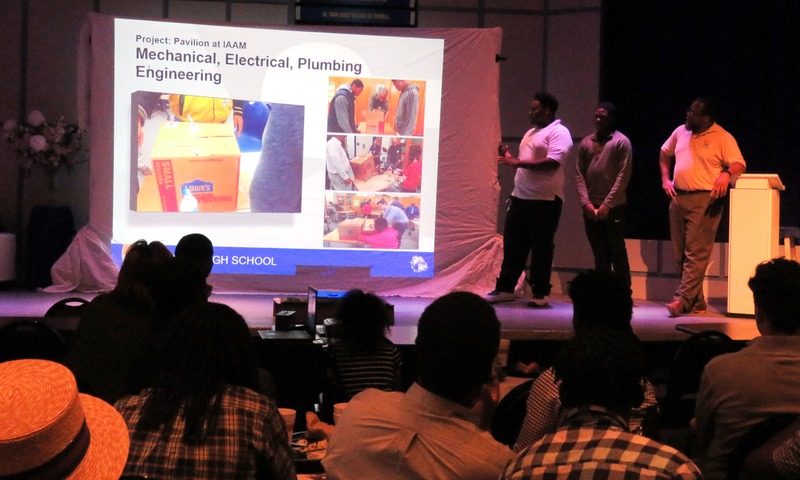 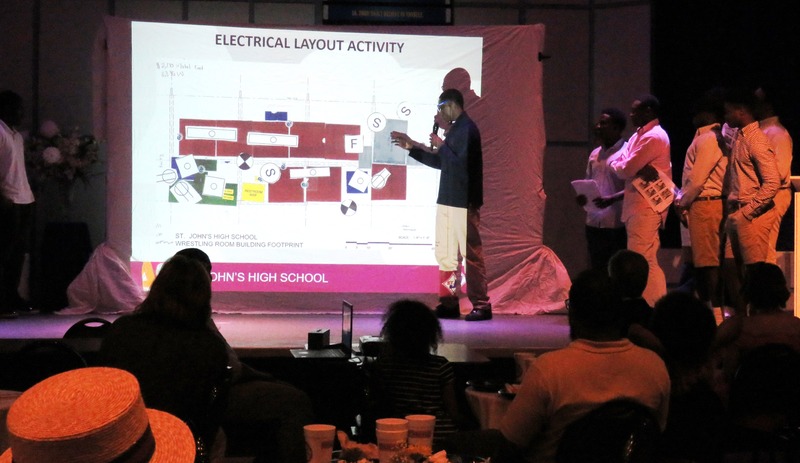 Stall High School made presentations of commercial projects that they had designed and worked on over the past school term under the mentorship of professionals from the three aforementioned tiers of the construction industry. 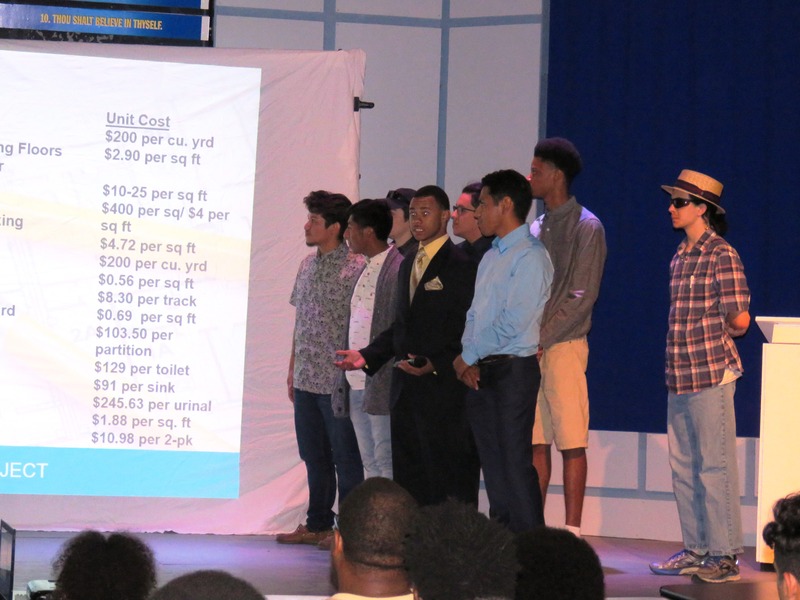 a wrestling facility complete with engineering drawings, construction budgets and support materials by St. Johns HS students; and a regional recycling center with the “world’s biggest recycled water bottle” fountain along with all the other documentations by R. B. 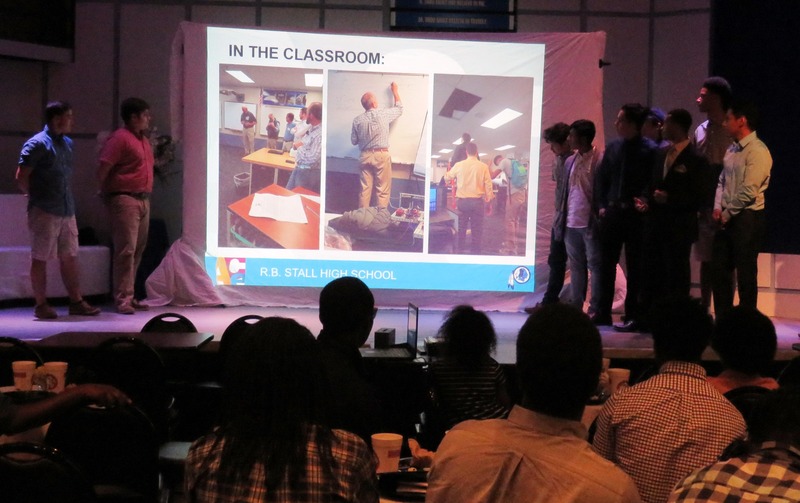 Stall HS students. 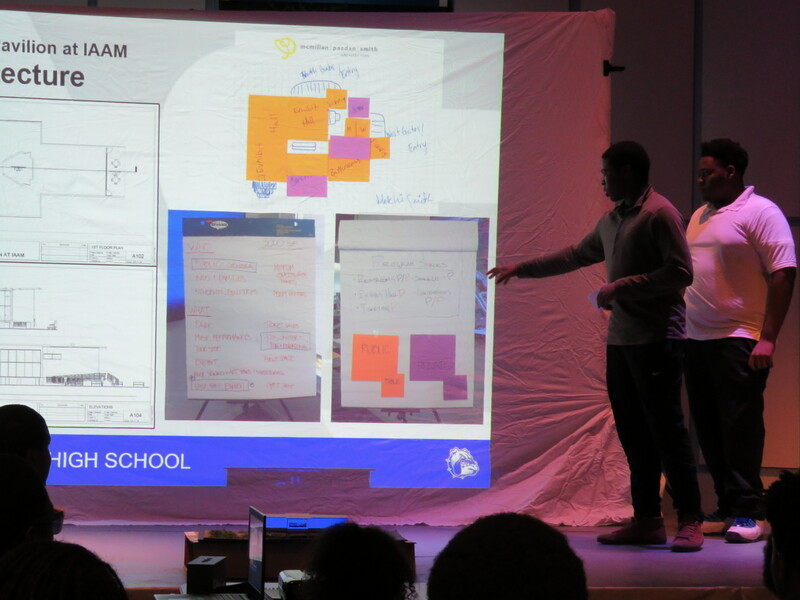 The projects were ambitious, well planned with acute attention to details, and served their functions within our extended community amazingly well. 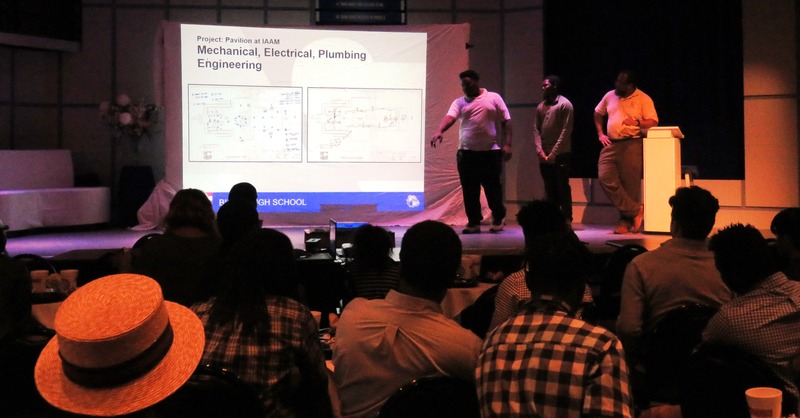 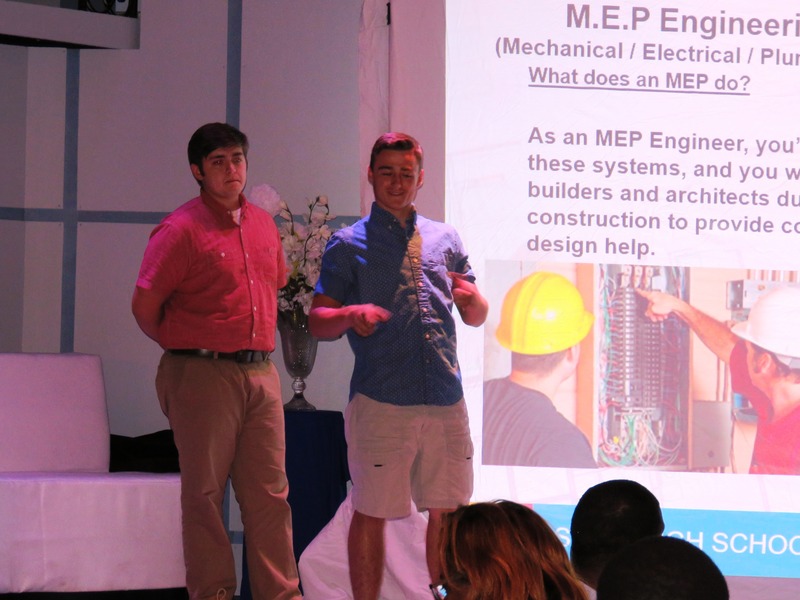 The presentations were complete with every step of the planning and development process for these projects, and the students were articulate, at ease and presented to the room of some 100 attendees as well as most professionals. 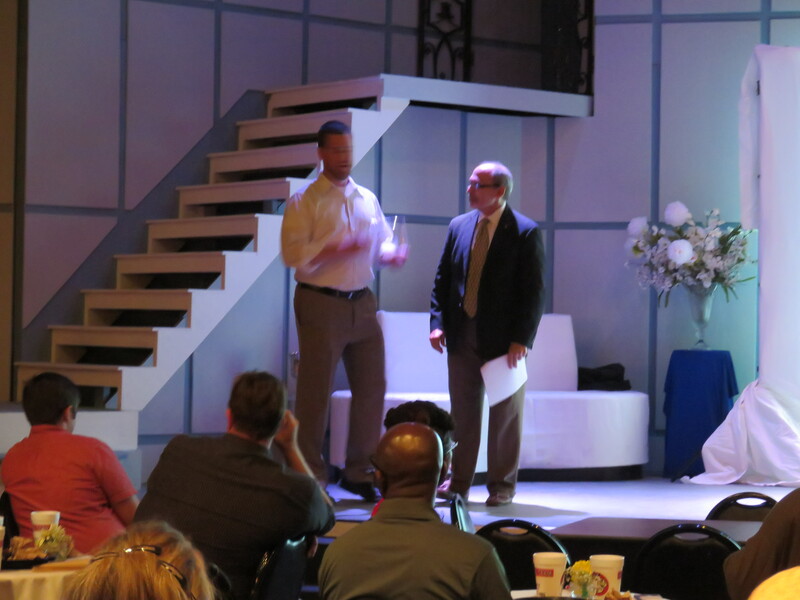 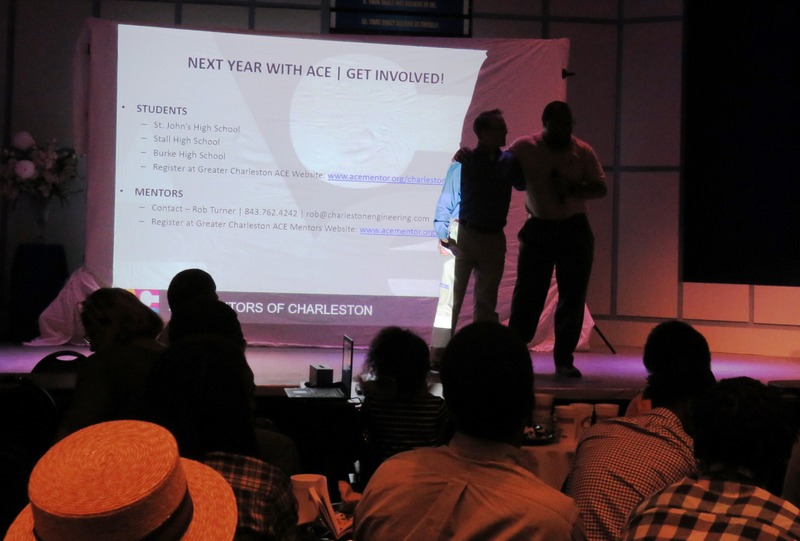 I was proud of the efforts, and realized that the ACE Mentoring Program, along with select educators from the CTE department of Charleston County Schools working with them was helping to develop our community’s future through solving real world development problems. 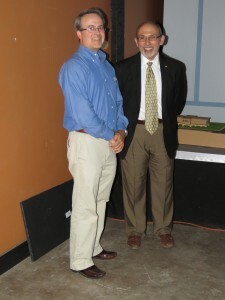 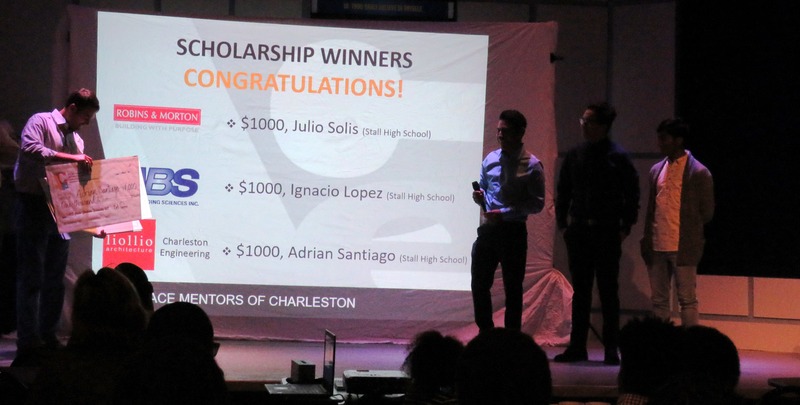 They even gave three $1,000.00 scholarships to deserving students! 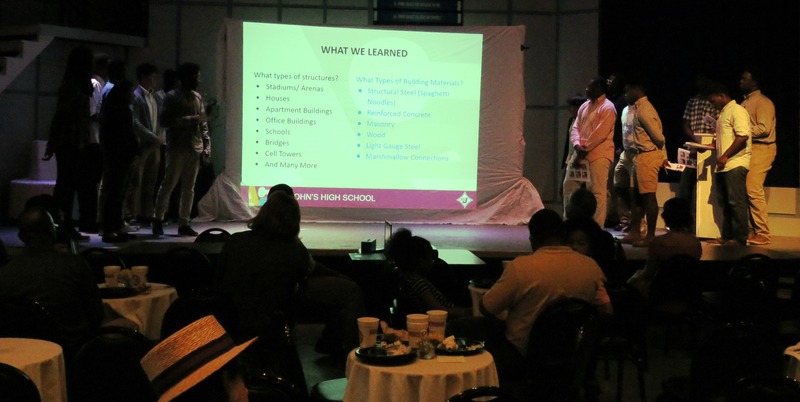 Only 2 students from Burke HS were able to attend the event due to a conflict with their school’s senior night. 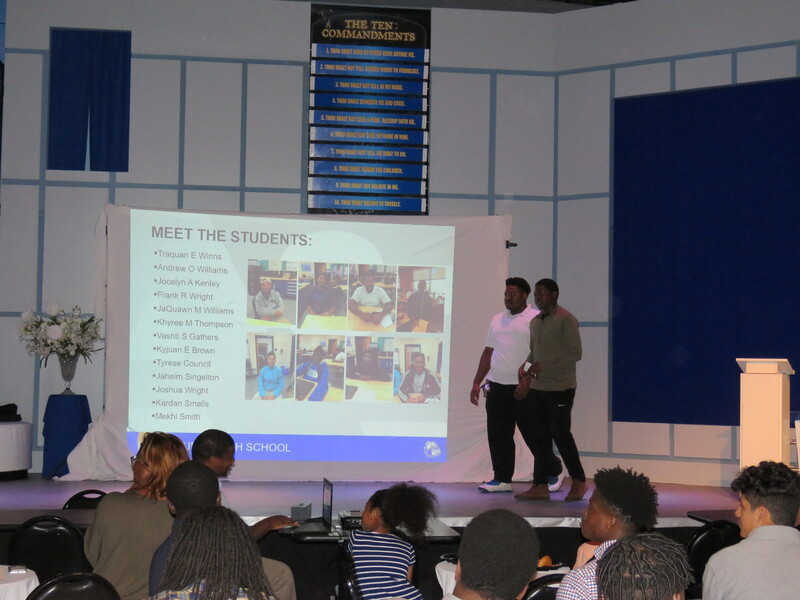 Mr. Kemp shared this picture of the students, teachers, and their ACE Mentors taken in the classroom. 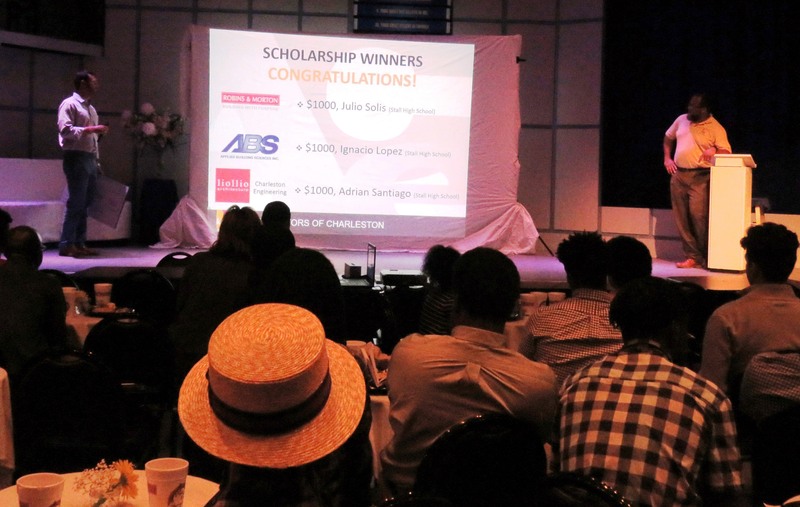 Three students were indeed awarded scholarships to continue their education in the ACE professions in college. 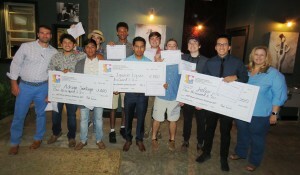 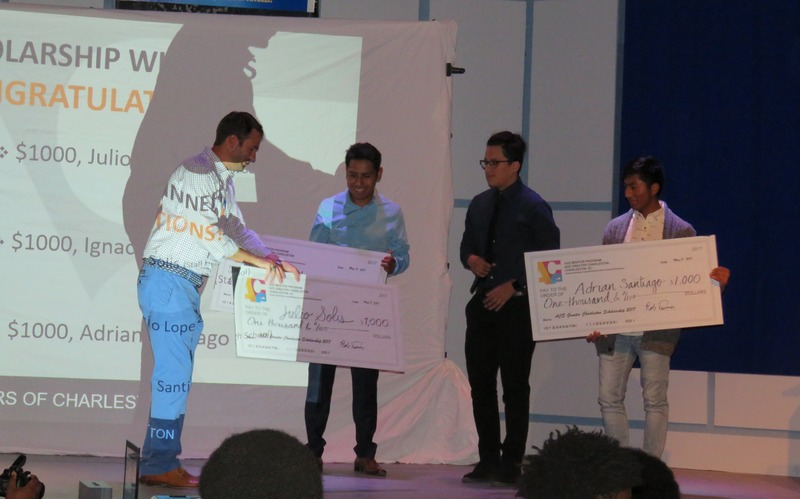 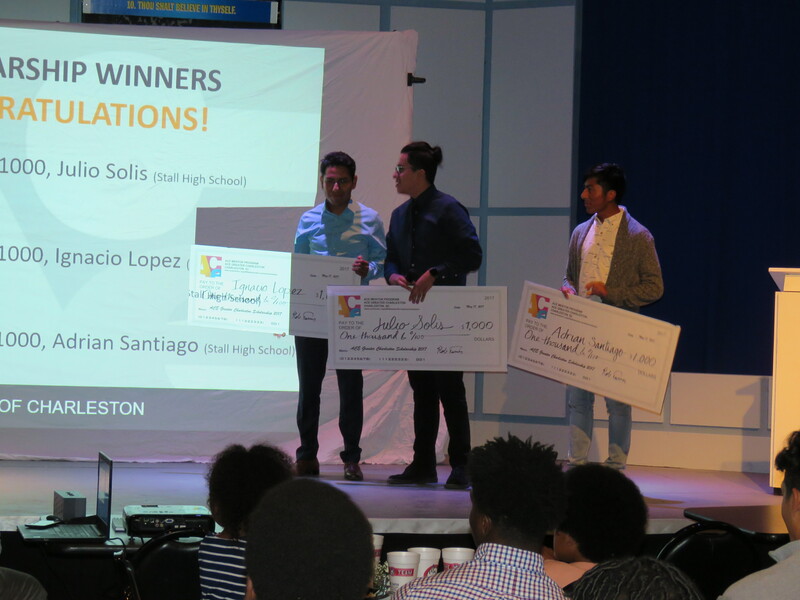 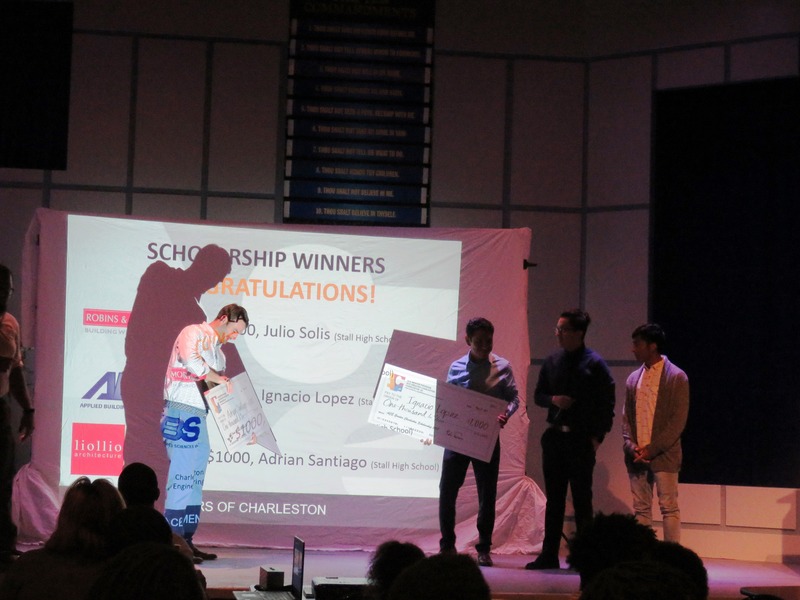 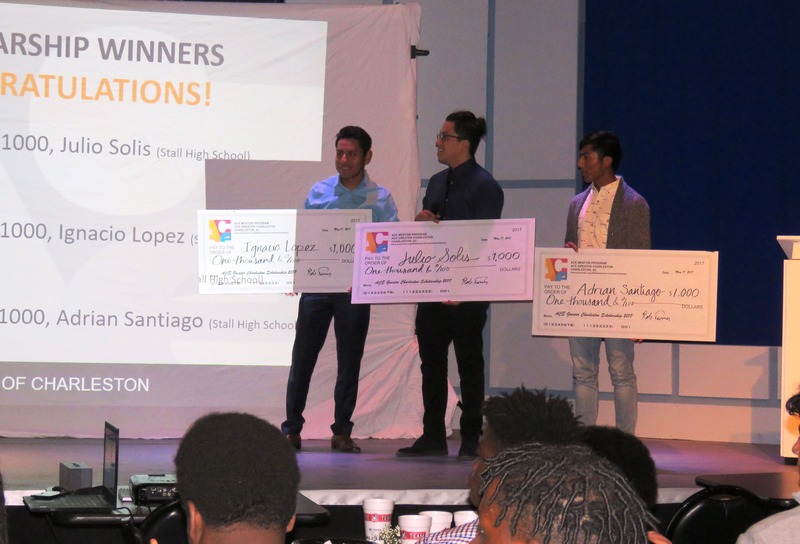 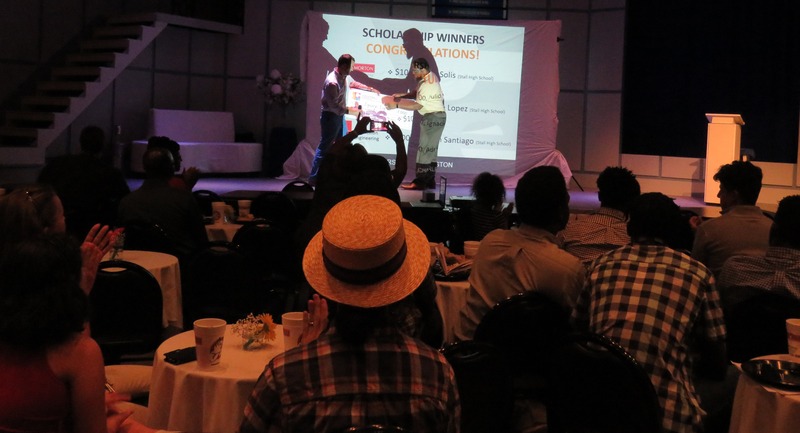 Congratulations to Julio Solis, Ignacio Lopez, and Adrian Santiago on their scholarship awards! 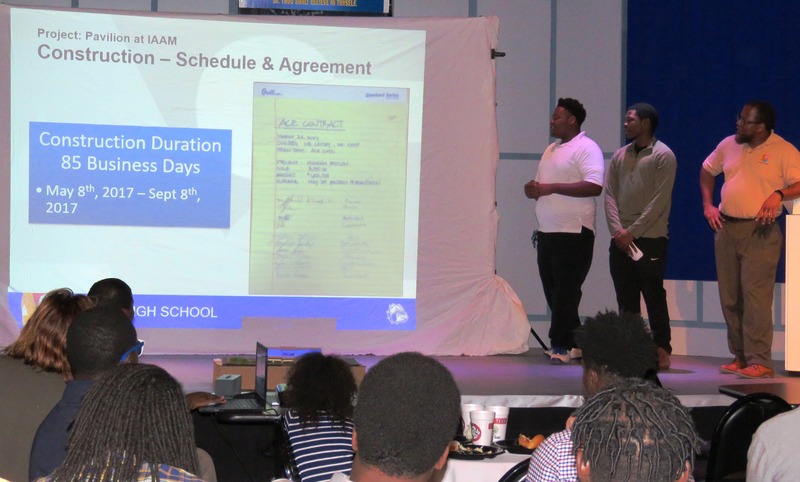 All three are graduating seniors from R. B. 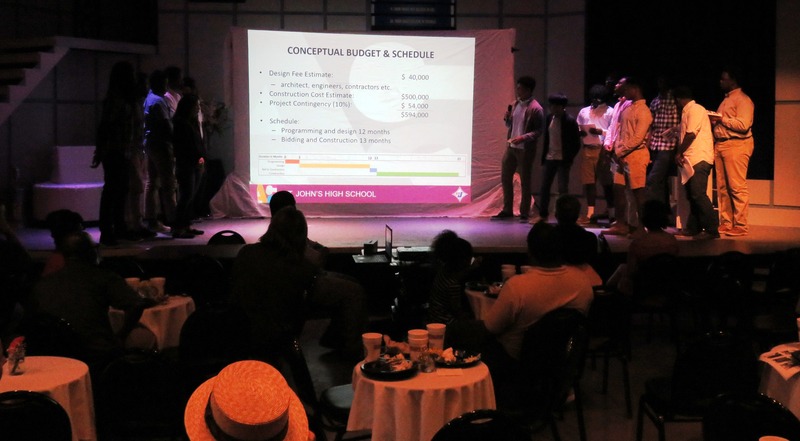 Stall High School. Thanks to the school faculty and parents for attending to celebrate these students’ achievements. 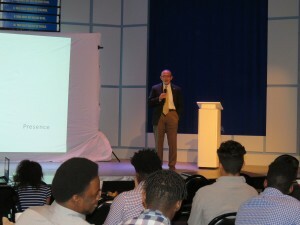 Thanks to Dinos Liollo for delivering an excellent keynote. 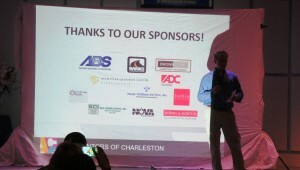 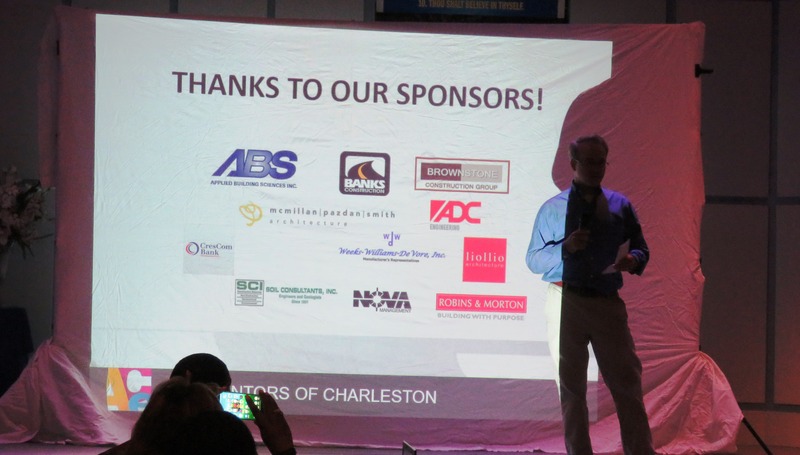 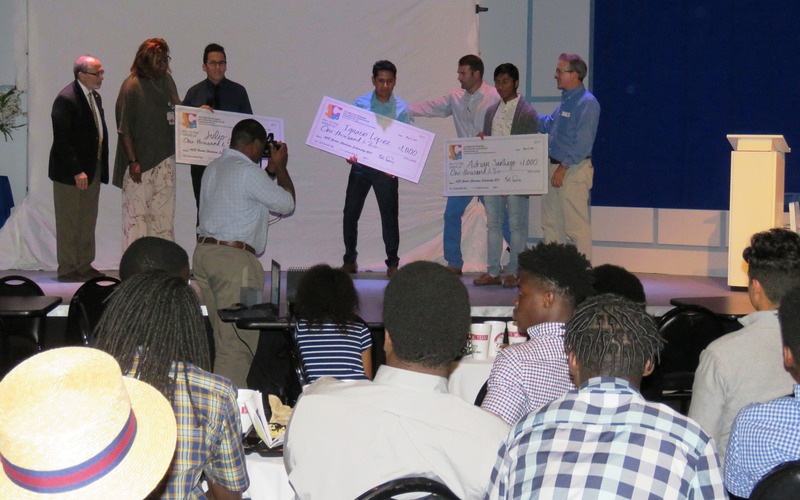 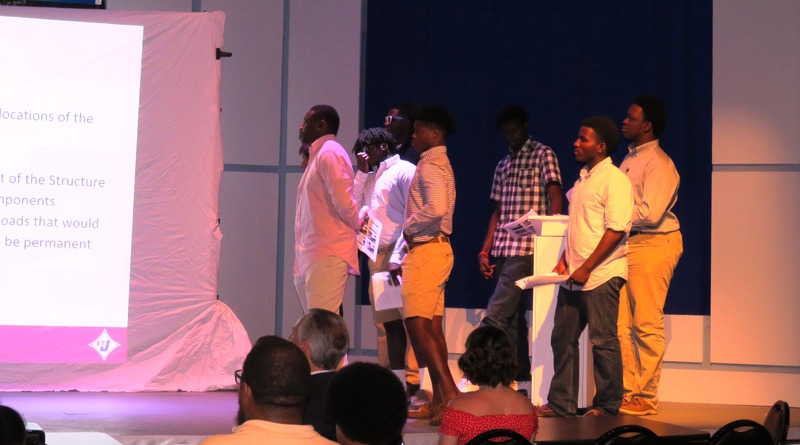 Thanks to Rob Turner, Chairman of the ACE Mentors of Greater Charleston Board and all the volunteers and supporters of this terrific program for their investment of time and talent, and for a wonderful celebration for all involved to end the year!